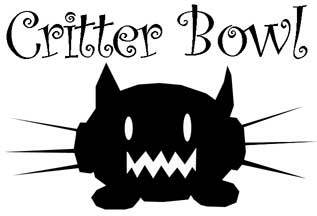 So, yesterday I traveled five and a half hours north to Norman, OK to participate in CritterBowl IV. CritterBowl is a charity/baby shower tournament held by the hosts of the Both Down podcast, for one of the guys in their league. It was a smaller tournament with a turnout of eight coaches. It was a great opportunity to meet a few new coaches and make some friends in a small, intimate environment. Below are the results of my four games at CritterBowl. I originally posted these game results as separate posts, but I think it will work better as all one single post. I brought my trusty Orc team, though I did do a little roster tweaking from what I usually bring. Anyway, I scored first in the first half and despite my decreasing numbers, I managed to hold my own against him. I held him off until turn seven of the second half, where he managed a miraculous goblin tossing touchdown. The game ended in a 1-1 tie. All in all, it was a fun game played against a really nice guy. Game two was played against Steve of the Both Down podcast and his Chaos Dwarves of Death, Doom, and Poopie (my name for his team, not his). Again, I fought to a 1-1 tie, but this time I was the one who managed to get the last second TD. I was still out casualtied, but not by near as much. Ties are not as great as wins, but they are better than losses. At this point we took a quick break for lunch. We had some tasty pizza that, for some reason, was not actually cut into slices by the pizza place… WTF!? Game 3 found me facing another Goblin team, but Nuffle finally favored me in this game. My opponent (I forget his name because I am terrible with names… Sorry, sir! ), and his stunties put up a valiant effort, but the dice just did not treat him well. I kicked off at the start, but managed to get possession of the ball about half way through the half. I scored at the end of the half, and then received at the start of the second half. With his dwindling numbers, I managed to get close to the ends one quickly, but stalled for a couple more turns to cut down the chances of him scoring two quick Goblin tossing touchdowns. With only a few turns left, I kicked to him, but he was unable to get the ball. I managed to run in, grab the ball, and score a last turn, third touchdown. Won the game 3-0 and finally did more casualties than my opponent. Going into game 4, I only had one win, but I still did not have any losses, so I was feeling pretty decent. Game 4 was against Scott from Both Down, and his Dark Elves. Luckily for me, Scott only had one Witch Elf because Frenzy can be rough when your opponent is good at using it to push your players off the pitch… And Scott was. Game 4 was, again, a very competitive, and close game. As with every other game that day, I kicked off to start. Scott did a very good job holding me off and scoring late in the first half. He pushed several of my key players off the pitch, but luckily, none of them got hurt more than simple KOs. Starting the second half, most of my players came back, back and I believe Scott was down a couple by that point. I managed to muscle my way to the end-zone around turn three, and hoped that I could manage to get the ball back and actually win instead of ending the day with a third tie. Scott did his best to keep that from happening and turn 7 saw him 4 squares from the end-zone in possession of the ball. I outnumbered him by a little bit by this point, and Scott wanted to end the day with a win as much as I did. He attempted a leap to get to the end-zone, but unfortunately for Scott, he failed his landing and dropped the ball. In my previous turn, I had run a single blitzer back toward the other end-zone hoping that I could manage to get the ball back. On my final turn, I had a thrower close to where Scott’s player dropped the ball. I managed to get him to the ball, picked it up and had just enough movement to put my blitzer in Long Bomb passing range. In the luckiest rolling I have ever had in a game of Blood Bowl, I managed to successfully complete the pass, then run the blitzer into the end-zone for the win. Scott was a very tough opponent, and it was really only his bad luck, combined with my good luck that allowed me to pull out the highlight reel win. Even though I only won half of my games, thanks to the fact that I did not actually lose any games, I managed to end the day with a second place finish. I believe I ended up being the only coach without a loss. To sum things up, I had a really good time, met some really nice people, shared a lot of laughs, and I look forward to going back for Orclahoma Bowl in March. The Oklahoma guys made me feel at home, and I recommend that everyone who is interested in Blood Bowl check out the Both Down podcast.